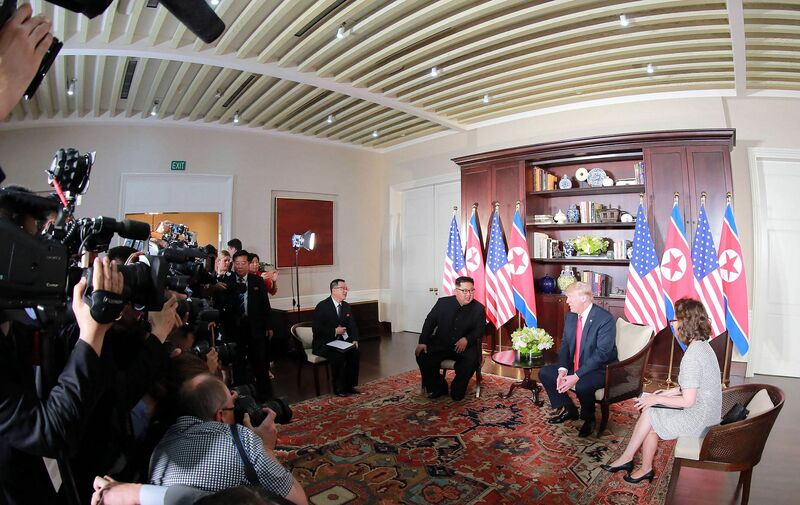 That Singapore held off strong competition to host the historic meeting between US President Donald Trump and North Korean leader Kim Jong Un is evidence of its rising international influence, while its ability to organise the event without a hitch highlights the efficiency the country has always been proud of. Whatever the outcome, Singapore has come out the winner. From the Wang-Koo summit in 1993 to the Xi-Ma meeting in 2015, to this year's Trump-Kim summit, Singapore has played host to several historic events. If the impact of the first two meetings was limited to East Asia, the Trump-Kim summit was one of global magnitude. To be chosen by both the United States and North Korea shows that Singapore's influence is one that extends beyond Asia. Considering that Singapore is a small country only one-tenth the size of Guangzhou with a population of just 5.6 million, this is an impressive achievement. One key reason the Trump-Kim summit could be held in Singapore is that both the US and North Korea have embassies there, which cannot be said of many countries. While North Korea has diplomatic relations with over 160 countries, it has embassies and consulates in only about 40. This is because years of international sanctions have meant that North Korea has limited funds, to the extent that its foreign missions serve not only diplomatic functions, but also as a means of generating revenue, with its premises let out for commercial activities. Singapore's location and status as an Asia-Pacific trade and financial centre are also very attractive to North Korea. As far back as May 1967, North Korea and Singapore had a trade office. This was "upgraded" to diplomatic relations in November 1969, 21 years before diplomatic ties between China and Singapore were established. Currently, Singapore citizens can travel to North Korea visa-free for 30 days. Politically, Singapore maintains good ties with North Korea. In 2016, Singapore was North Korea's eighth-largest trade partner; however, economic and trade ties were curtailed in November last year under the pressure of United Nations sanctions. The mutually beneficial relationship between Singapore, with its strategic location, and the US as a superpower needs little elaboration. Under an agreement signed in 2000, Singapore's Changi Naval Base provides logistical support for US Navy vessels, greatly expanding the reach of its 7th Fleet. One important principle of Singapore's foreign policy is to be a friend to all and an enemy of none. This is realised not through currying favours or sacrificing its own principles, but through nudging the other party such that it will act in Singapore's favour. Former US secretary of state Henry Kissinger once noted that the late Mr Lee Kuan Yew had never bowed down to get what he wanted. In their many discussions in the past, Mr Lee never asked him for anything for Singapore, he recalled. What Mr Lee did was to explain Singapore's importance in the international system, in the belief that smart people would naturally come to their own conclusion to invest in Singapore and help it grow. At the same time, Singapore is not afraid to confront big powers on issues concerning its key interests. On the matter of differences between China and Singapore over the South China Sea arbitration ruling in 2016, the Chinese generally did not accept Singapore's reason that it was "upholding international law and freedom of navigation", and labelled the country as "anti-China". However, in the recent trade dispute between China and the US, Singapore supported China's stand on free trade. To many, Singapore may appear to have reversed its position on China, but in Singapore's view, it has been consistent in upholding international law, navigational freedom and free trade; as a small island state, it cannot survive without any of these. Clearly, any decision by Singapore is based on its own interests, deliberated on a case-by-case basis and never broadly "anti-China" or "pro-China". For any two countries to be close, their interests must dovetail. One would be naive or overbearing to demand other countries to forgo their interests for one's own. China is a big country with a longstanding concept of "tianxia" (literally "all under heaven", a traditional Chinese concept of world governance). Many ordinary Chinese citizens have a keen interest in international affairs, while the Chinese government also encourages such interest. But many small countries are mainly concerned about themselves and their region, and are not as interested in what is happening on the bigger global stage. With its small size and population, Singapore is a "small nation" in every sense of the word, but its vision, ambition and interests are definitely world-class. From the days of Mr Lee, Singapore leaders have spoken out on major issues such as globalisation, China-US ties and China-India relations. It was Mr Lee who started this tradition. He was not afraid to say what he thought, even if his views - such as those on the shortcomings of democratic institutions drawn up by the West for its former colonies - came across as politically incorrect. When asked if Chinese leaders were ready for China to supplant the US as the leading power in Asia and even the world, Mr Lee did not hesitate in saying yes. China had the potential to become a superpower and the sense of mission in China's renaissance was strong, he noted. It also wanted the world to accept it for what it was, not as a subsidiary of the West. Singapore's international influence can be traced to Mr Lee and the views he articulated on world affairs. Dr Kissinger described him as "an indispensable friend of the United States, not primarily by the power he represents, but by the excellence of his thinking. His analysis is of such quality and depth that his counterparts consider meeting with him as a way to educate themselves". Mr Lee's successors, Mr Goh Chok Tong and Mr Lee Hsien Loong, have continued the tradition of speaking out on matters of global import. This can be seen as an important means by which Singapore keeps up its international profile, giving it the edge in hosting the Trump-Kim summit. To be sure, commenting on other countries' affairs comes with a price; the dispute between China and Singapore over the South China Sea arbitration issue being a case in point. Mr Lee Hsien Loong's comment that the tribunal had made a "strong statement" in its ruling angered the Chinese government and its people. Against this tense backdrop, in November 2016, nine Singapore Terrex vehicles that were on their way back to Singapore after an exercise in Taiwan were seized by Hong Kong Customs. Singapore clearly was not mentally prepared for this turn of events and there were even calls for self-reflection. In fact, on a visit to the US in July 2016, Mr Lee Hsien Loong had expressed his unhappiness with the US for not signing the United Nations Convention on the Law of the Sea, but many Chinese did not know about this or chose to ignore it, while the seemingly less sensitive Americans just did not engage Singapore on it. Hosting the Trump-Kim summit is a result of Singapore's years of hard work on its hard and soft power, paving the way for more international summits to be held there in the future, which will increase its influence on the international stage. Still, the key to this happening is whether Singapore can continue to maintain its high standards in the long run. Its economic development and internal governance have to be way better than its neighbours', and there should be no major misjudgment on global affairs, which is especially important as Singapore faces a leadership transition. This article by Zhao Lingmin, a columnist with the Financial Times, is an edited version of the original commentary first published on June 12 in FT's Chinese edition. The views are the writer's own.